For ‘Open Heart Surgery’ James Bridle created three banners for the facade of the exhibition venue. Each banner features a single symbol: the first, a circle with a lightning bolt through it (symbol of the international squatters movement); the second an @, used to denote digital location or direction; the third, the stylized nebula of The Cloud and its now ubiquitous networks of data-storage and processing resources. In sequence they convey the message of the works title, a message printed on top of pixelated versions of the virtual (perfect gradient) skies found in architectural renderings, like those adorning nearby building sites. 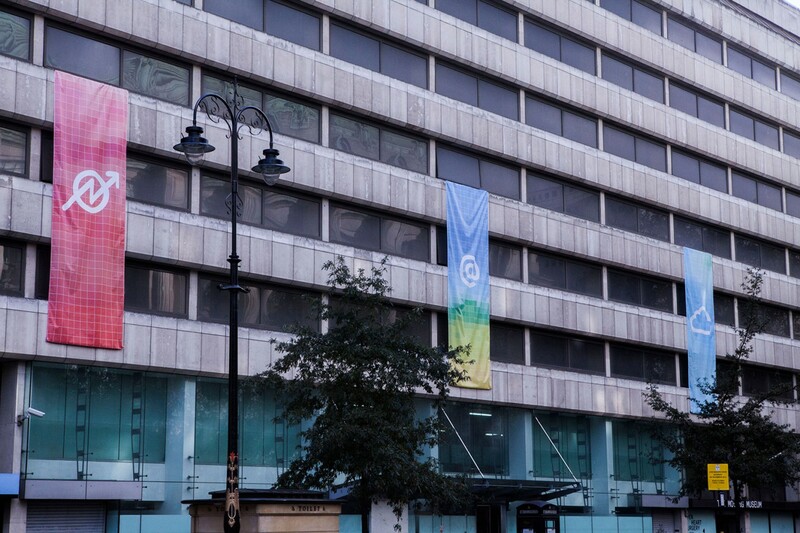 The banners are draped over the outdoor window sills and held in place by the office windows in an installation inspired by the makeshift bedsheet-banners hung outside squatted buildings and follow The Bank of Ideas, Occupy London’s ‘repossession’ of an empty office building the previous November. Bridle coined the term ‘The New Aesthetic’ to describe the ‘increasing appearance of the visual language of digital technology and the Internet in the physical world.’ It is from this dualism of public spaces that the project arose, addressing issues of online privacy, social engineering, and technological determinism within longer established visual languages of en situ protest and advertising. It addresses its context, the shell of brutalist icon 180 The Strand, located a stones throw from the City of London and once home to The National Bank. Now a centre for creative industries, housing fashion, art and broadcast studios, hoardings next door at the time boasted “a luxurious new development of stunning apartments and penthouses”. Bridle’s initial plan was to create flags displaying his ‘Render Ghosts’, the figures who appear in architectural visualisations, to mark their occupation of a liminal space between the real and the virtual, present and immediately imminent future. After the artist’s experience of censorship in Australia a month prior to the exhibition, during which a major installation of his project ‘Drone Shadow’ at the Brisbane Writers Festival did not take place, he took the opportunity instead to make a ‘very public work,’ stating ‘there was no point in being subtle.’ A second driving force for this project was a change in legislation brought about at the end of 2012 in response to the activism of Occupy London, which began at St Paul’s Cathedral. It made squatting on residential property a criminal offence in the UK, while squatting in non-residential property is now, considered either a civil or a criminal matter, dependant upon circumstances. ‘Occupy the Cloud’ was created as both “both a marker of occupation and an appeal to action—to occupy and transform the notion of the ethereal cloud.” It frames what is ostensibly an apolitical form of global infrastructure as a space of negotiation, an extension rather than escape from the inequalities that plague the urban environment. By placing the amorphous network of computing power that forms the cloud alongside centralised political and industrial systems, it asks us to begin shaping our position towards it. James Bridle (b. 1980, London) is an artist living and working in Athens. He received his MA in Computer Science and Cognitive Science from University College London specialising in Linguistics and Artificial Intelligence. Selected solo exhibitions include Galleri Image, Aarhus, 2016; Serpentine Galleries, London, 2016; Aksioma, Ljubljana, 2015; Nome, Berlin, 2015; The Photographers Gallery, London, 2015; Bold Tendencies, London, 2014; Corcoran, Washington DC, 2013. Recent group shows include Baltic, Gateshead, 2017; Holden Gallery, Manchester, 2017; Museum Angewandte Kunst, Frankfurt, 2017; Centro de Cultura Digital, 2017; Hasselblad Foundation, Gothenberg, 2016; MoMA, New York, 2016; Whitechapel Gallery, London, 2016; Somerset House, London, 2015-16; Witte De With, Rotterdam, 2015; KW, Berlin, 2015; Victoria & Albert Museum, London, 2015; PinchukArtCentre, 2014-15; Hayward Gallery, London, 2014-15. Bridle received an honorary mention from CERN COLLIDE in 2016. In 2014 he was shortlisted for the Future Generation Art Prize and was awarded the Excellence Award at the Japan Media Arts Festival, the Graphics Award at the Design Museum Designs of the Year. His writing on literature, culture and networks has appeared in magazines and newspapers including Wired, Domus, Cabinet, the Atlantic, the New Statesman, the Guardian, the Observer and many others, in print and online. He lectures regularly at conferences, universities, and other events and his formulation of the New Aesthetic research project has spurred debate and creative work across multiple disciplines.